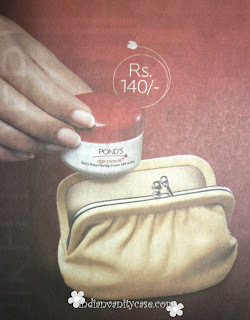 Don't want to invest on a full jar of Pond's Age Miracle Daily Resurfacing Cream? Get the 10 gms handy pack for just Rs.140. Let's find out if the best things really do come in the smallest of packages. Unless size matters to you. what are your thoughts on the cream itself? ?is it too thick for ppl with combi skin you think? looks cute. we can try and buy the big one :). oo i saw this ad in the paper today. don't know about the product itself, but the purse is so elegant! a little old fashioned, but so cute. @HD~ Hi there, I wonder if it is the same as the one in the red bottle, which I'm using rt now. It also has little shimmer particles n yeah I'm really liking it too. The thing is there r 2 types of Age Miracle, the one in the red bottle n one in a jar. I've yet to see the diff betwn the 2.